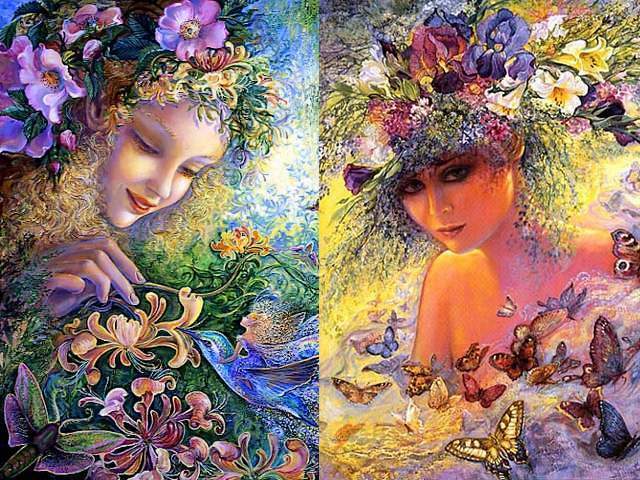 'Honeysuckle' (acrylic on canvas, 2007) and 'Flora' are two stunning artworks by the Mistress of fantasy, Josephine Wall, specialized in mystical, surreal-like paintings. She has an amazing sense for light, color and for a visual story-telling. In 'Honeysuckle', the beautiful fairy is represented to fondle gently Bluebird, a symbol of the happiness, with a stem of honeysuckle, surrounded by butterflies and bees attracted by the gorgeous blossoms in shape of bells and the nectar with a strong sweet scent. The delicate and beautiful face of Flora, the Roman goddess of flowers, radiates a soft glow, among the abundance of flowers with fragrant petals and butterflies fluttering around them.